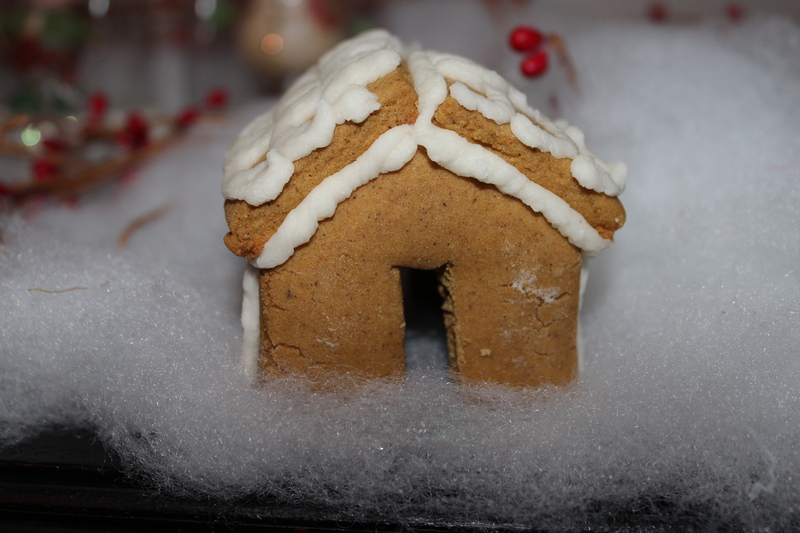 It has been awhile since I blogged..it’s always a busy time during the holidays! Over the holidays we also celebrated my sister’s birthday, which gave me the opportunity to try out a few gift wrapping pins that I’ve been wanting to try for awhile! 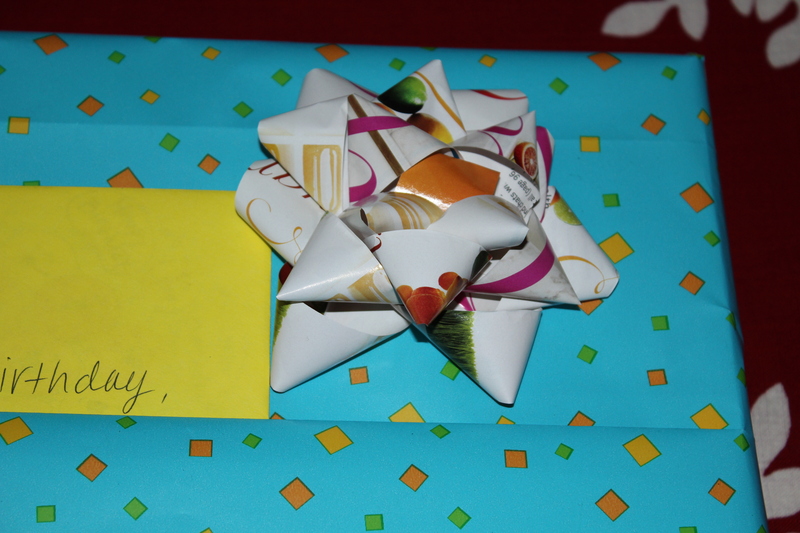 The first one is courtesy of Martha Stewart….how to wrap gifts to include a pocket that holds the card. 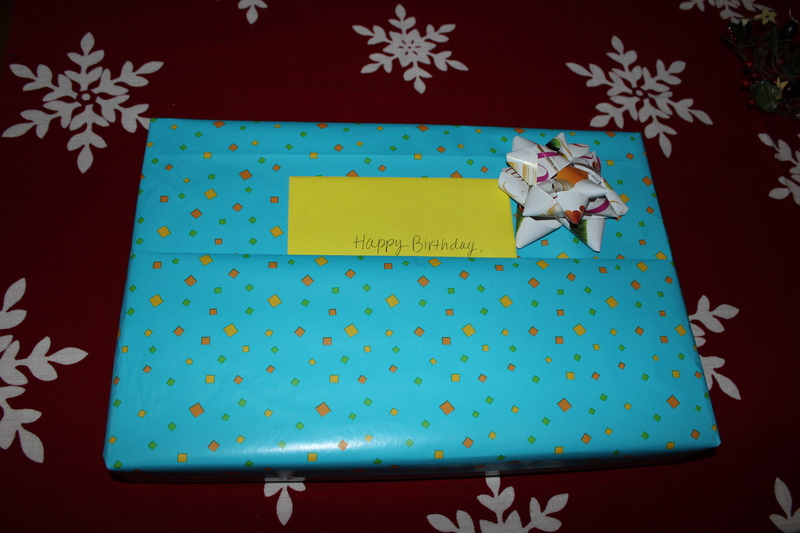 The second is how to make gift bows, using pages from magazines. 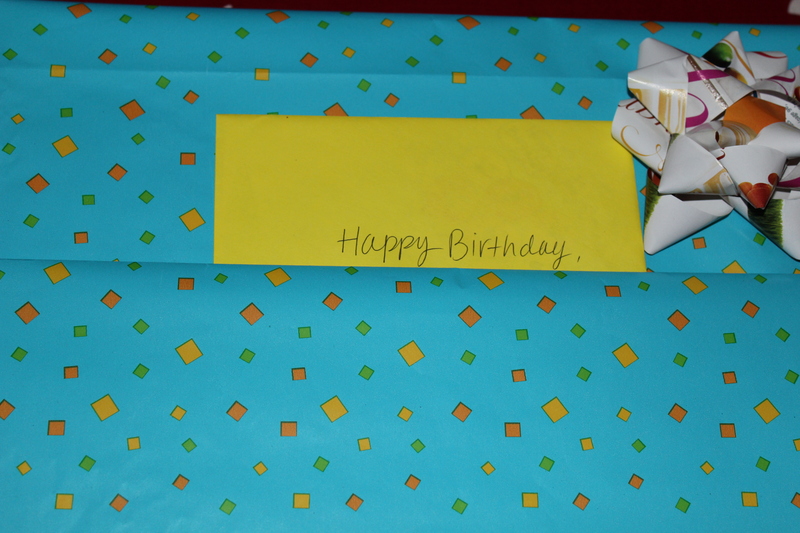 I usually use ribbon when I wrap gifts, but now that I know how to make bows, I’ll be using them more often. This week my goal was to start & finish my Christmas baking. Thanks to a few vacation days, it was easily accomplished. We have certain baked goods that we make every year…it’s tradition! These include sugar cookies, gingerbread cookies, peanut butter balls. Every year I try one or two new recipes and sometimes those are included in the yearly pre-holiday baking days. I’ve even found recipes during the past 2 years on Pinterest that are now a key part of my Christmas baking (I’ll save those for another post). So, in preparation for my baking days, I looked at my Pinterest boards for something that stood out and would be easy to accomplish among the other recipes on the agenda. 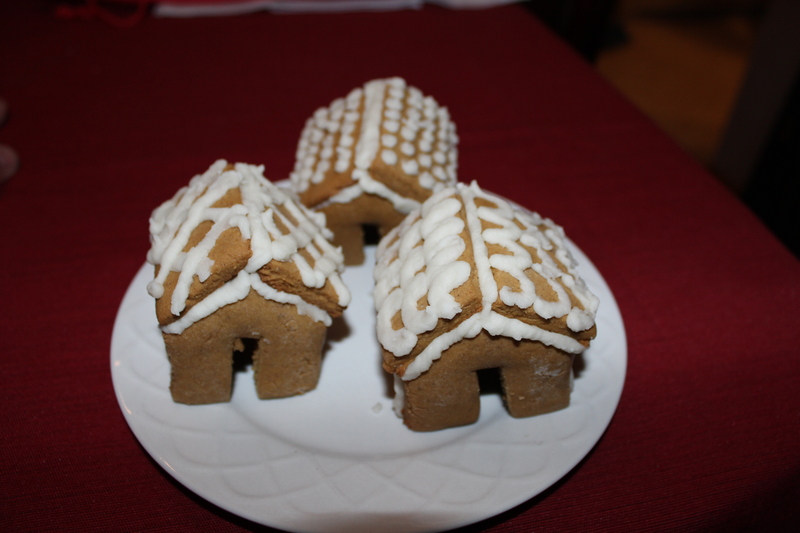 And then I remembered these….mini gingerbread houses! How cute are they!? I love the look of miniature food items (& should probably create a new board dedicated to them!). 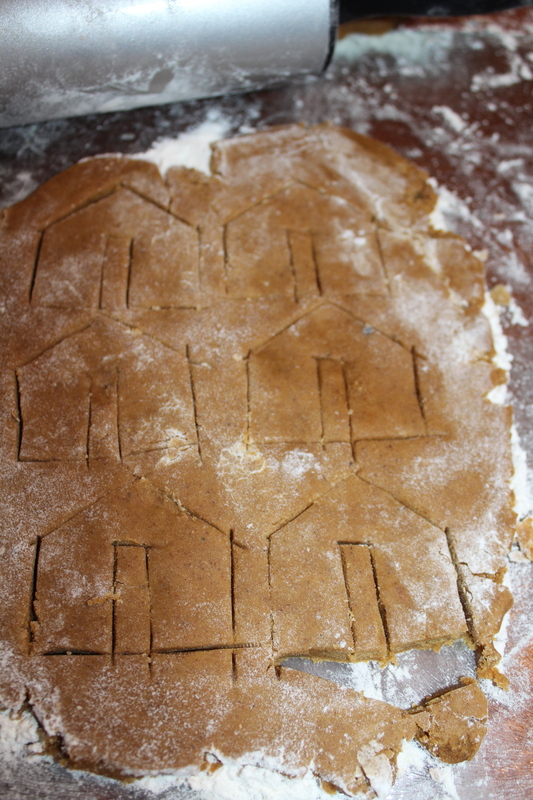 Since I was already making gingerbread cookies, I decided to make 3 mini houses with the dough I had leftover at the end. 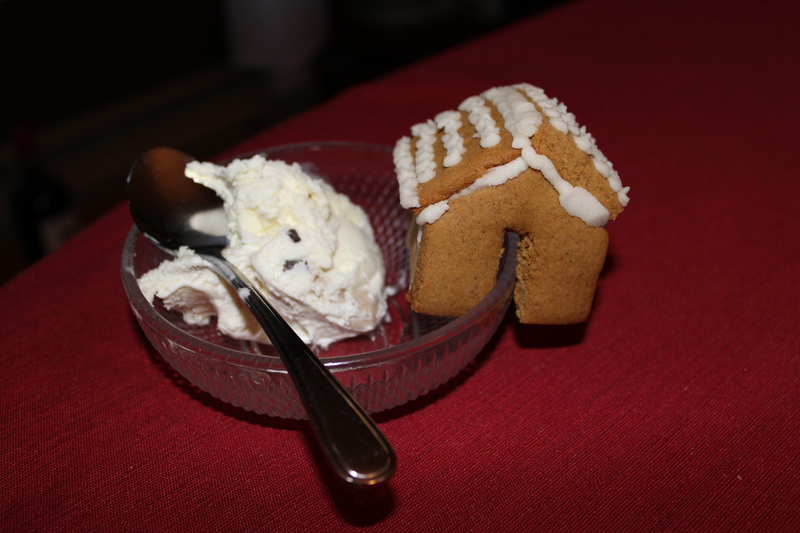 I use Martha Stewart’s gingerbread cookie recipe (available on her website). The link above provides a template. 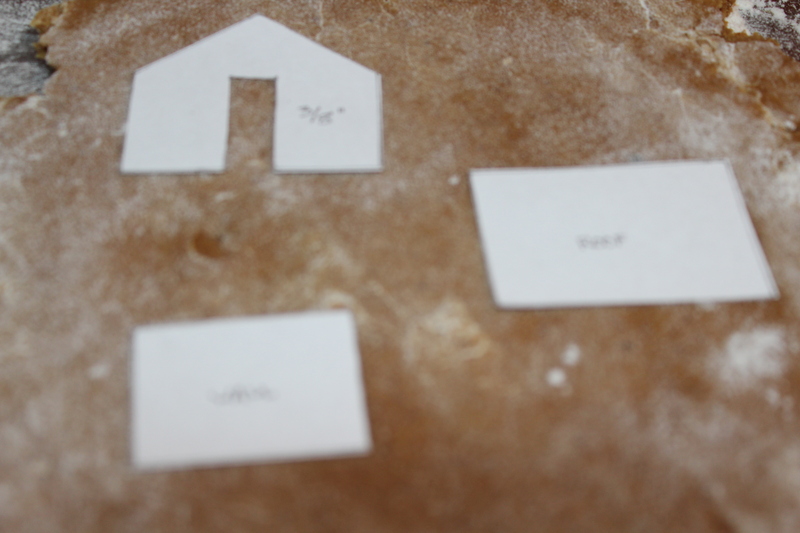 Rolled out the dough, place templates and cut. 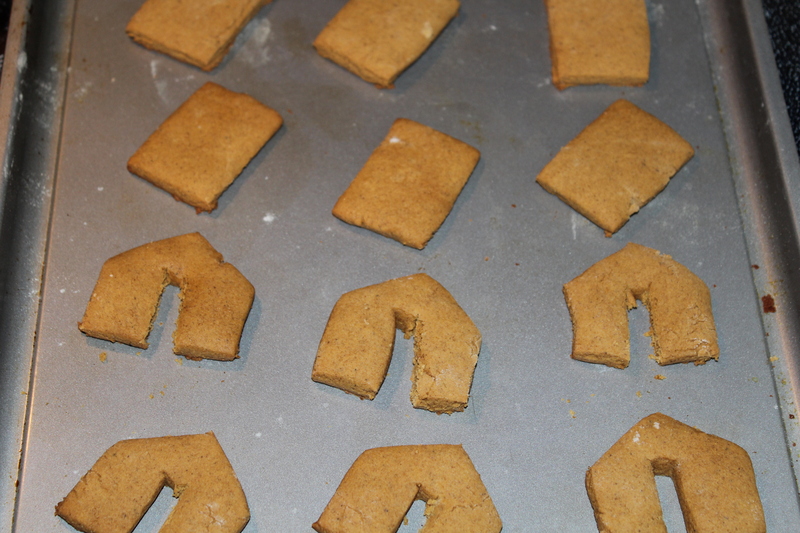 I used a butter knife to cut out the shapes (and therefore likely didn’t cut as precisely as I should have). Out of the oven. The cookies expanded and the door openings filled in, so I trimmed them with a knife as soon as they came out of the oven. Here they are! The instructions call for putting them together with royal icing. I used buttercream icing as I already had made some for the other cookies I was baking, and it worked fine for what I needed. The original poster of this idea made her houses to fit on the edges of coffee mugs. 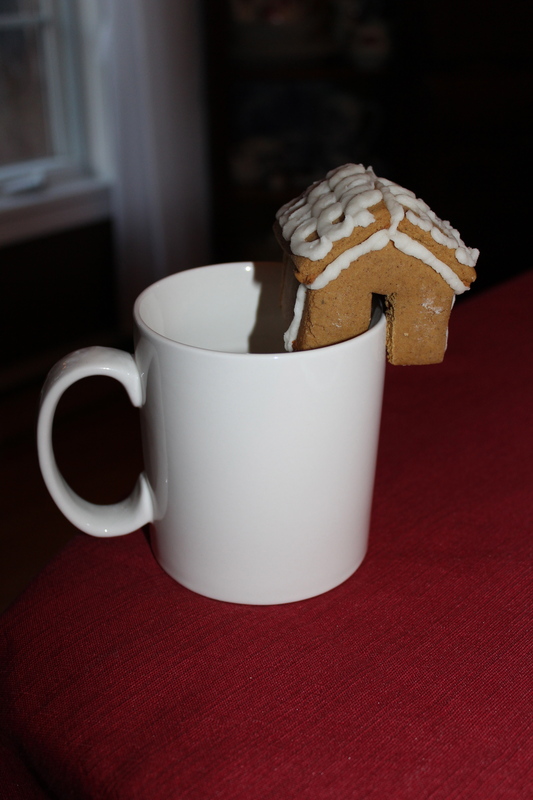 But here was the tough part…I had a difficult time finding a mug it would fit on! Probably because I wasn’t as precise when I cut out the pieces. I managed to fit it on this mug, but it was a tight fit. Would I make these again?! Yes! It would be fun to experiment with the size of the pieces and to decorate them with candies.